The trade deadline came and went Monday at 3pm Eastern, and the Carolina Hurricanes had essentially done nothing. 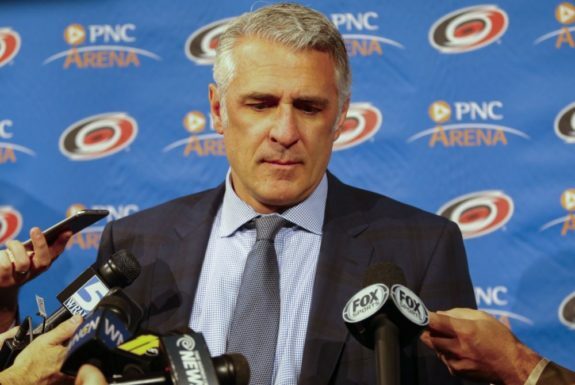 Other than moving Josh Jooris to the Pittsburgh Penguins in exchange for Greg McKegg, executive vice-president and general manager, Ron Francis stood pat through the trading season. After the deadline, Francis met with the media to talk about the lack of Hurricanes’ trades. It can be argued that Francis is committed to the process. He’s been building the Hurricanes with young talent – draft picks, prospects and the occasional free agent. He has yet to make a significant player for player trade that instantly impacted the team in a positive way. He has a plan and he is sticking to that plan. For the past three years it has been widely believed that then owner, Peter Karmanos was keeping a tight rein on the team’s finances. With Karmanos selling the team to Tom Dundon a few months ago, hope rose in the fans that maybe this would be the trading season that Francis would do something. When the clock struck three Monday afternoon, those hopes were dashed. I think we explored all things. Certainly we looked at a lot of pieces that we could add to our lineup. I think the prices were pretty steep this time around in our eyes. I don’t think we’re at a point where we can give up first round picks and eight prospects to try to get something we’ll have for a month or two and hope to get into the playoffs with that rental…We didn’t think the prices that they were asking for those pieces fit into where we are as an organization. What is interesting is that Francis said in answering the next question that “We’re in a playoff hunt. We haven’t been in that. This is a legitimate one.” The team was actually in a playoff hunt two seasons ago up until the last few games of the season. It toyed with trying to make the playoffs last season. The fact is that to those on the outside looking at the team, it resembles what has been happening year after year. The team is just not quite good enough to make the playoffs. There is a strong belief that adding a veteran scoring forward or two would get the Hurricanes back to the playoffs. I think it’s great that there’s actually people who care about it…We’re sitting with 20 games left three points out of a playoff spot. The “Caniacs” do care, and they are very frustrated with what they see as a refusal to deviate from the plan in a way that might make this team better and return playoff hockey to Raleigh. But, Francis is resolute even in the heat of criticism and second-guessing by the fans. As stated before, he has a plan and a vision of how to build a playoff team and he is sticking to that plan. As for this season, Francis said that it’s up to the guys in the locker room to try to turn things around, and that as the team is currently constructed, he still believes they can. Another serious concern is that Francis hasn’t brought a proven scoring forward to the Hurricanes. Many have weighed in that this is the missing piece in getting the team to the playoffs. Francis commented at a press conference last season that there weren’t a lot of available scoring forwards, and none that would make sense for the Hurricanes. This sounds exactly like what Francis said Monday, that prices were too steep and that nothing made sense for the Hurricanes based on where they are currently. No! 8 seasons going on 9 of no playoffs! @TDCanes wants to get fans in the building but @RonFrancis10 isn’t putting together a product worth paying to watch. I’ll save my money next season and just watch the games on tv. ? Francis is not going to buckle under the weight of fan frustration. And in the grand scheme of things he shouldn’t. Everyone is an expert, but only the person in the position has all the facts and can weigh all the ramifications of making this move or that trade. Francis is thoughtful and pragmatic. Can it be said that he is those things to a fault? Maybe. But, if the vision for the team that Francis sees ever does come into fruition, it most likely will be that of a team that becomes a consistent playoffs contender, has a deep farm system and is nimble regarding the salary cap. The fans and Francis hope that will be sooner rather than later.